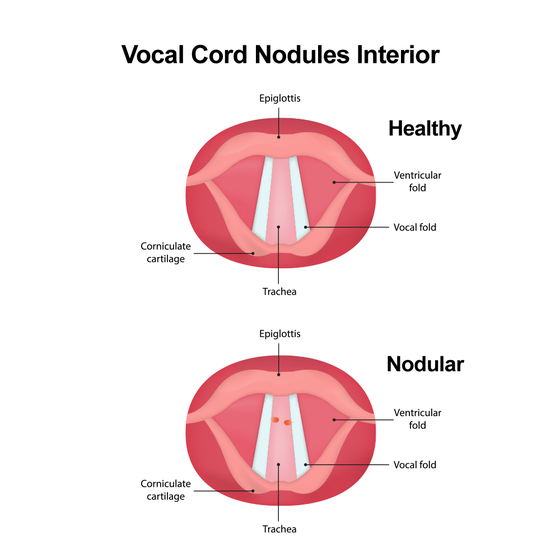 Vocal cord nodules are a common condition, especially among performers, coaches, and public speakers. Nodules are not a serious problem for your long-term health. However, they can impact your ability to speak, your quality of life, and, in some cases, your livelihood. 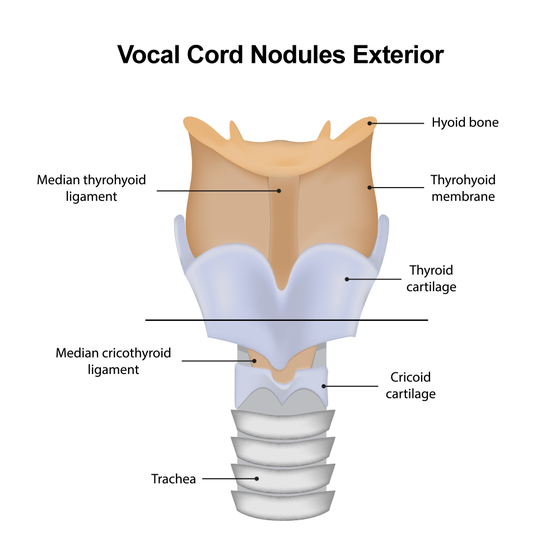 Our doctors use a wide range of sophisticated techniques to diagnose and treat vocal cord nodules at their Baltimore, MD, practice. At Chesapeake Ear, Nose & Throat, we will guide you through the lifestyle changes that can help improve nodules, and if necessary, we can perform safe, minimally invasive surgery. Your vocal cords are not actually cords, but folds in the back of your throat. When you speak or sing, the soft tissue will rub together. If you do so for long periods of time, in dry environments, or using improper techniques, the soft lining of your vocal cords will swell. Over time, the swelling will harden into small, noncancerous growths, or nodules. Nodules develop in pairs, with one on either side of your throat where your vocal cords touch. The growths will worsen as vocal abuse continues. Hoarseness is the most notable sign of vocal nodules. This symptom can also be a result of colds or allergies. However, if it persists for more than two or three weeks, you should schedule an appointment with a doctor. We will begin with a thorough diagnostic exam, and will inquire about your symptoms and evaluate your vocal tone. We will also visually examine your vocal cords using a laryngoscope. The small lighted camera will show your vocal cord movements on a video monitor, enabling us to look for nodules and other abnormalities. Our doctors always begin treatment by recommending lifestyle changes. To make a full recovery from vocal cord nodules, you will need to rest your voice. Typically, we will also refer you to a voice therapist, who will teach you new ways to speak or sing without straining your vocal cords. Following your treatment, it is important to take good care of your voice and to use proper vocal techniques. If you go back to your old habits, the nodules can return. Environmental changes can help to eliminate nodules and prevent them from returning. For example, you should quit smoking and limit your time in smoky or excessively dry environments. The time it will take for the nodules to diminish will depend on your body, how strictly you rest your voice, and their original size. Only if lifestyle changes prove ineffective will our doctors recommend surgery. We will use minimally invasive techniques to remove the vocal nodules without affecting the rest of your vocal cords. In most cases, we will recommend voice therapy in conjunction with nodule removal. Following your treatment, it is important to take good care of your voice and to use proper vocal techniques. If you go back to your old habits, the nodules can return. At Chesapeake Ear, Nose & Throat, we understand the devastating effects of vocal cord nodules, especially if performing is your passion or livelihood. Contact us today for the compassionate, effective care you need.